My Account allows you to see your application expiration date, request a quote and renew your account. 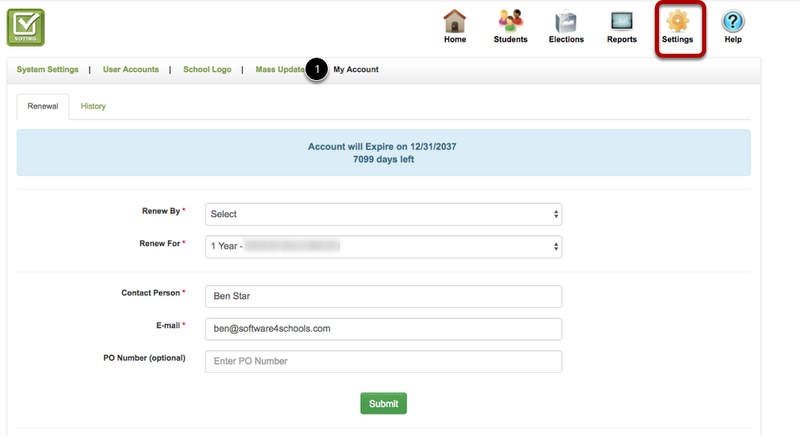 There are three ways you can renew your account depending on your school district policy. 1. Renew now and pay by credit card: This first option will allow you to enter your credit card information and instantly renew your account. A paid invoice will be sent to your email. 2. Renew now and send me an invoice to pay by Check: This option will renew your account instantly and an invoice will be sent to your email address which you can pay by check only. 3. Send me a quote, but do not renew yet: This will NOT renew your account. Often schools need a quote in order to generate a Purchase Order (PO). 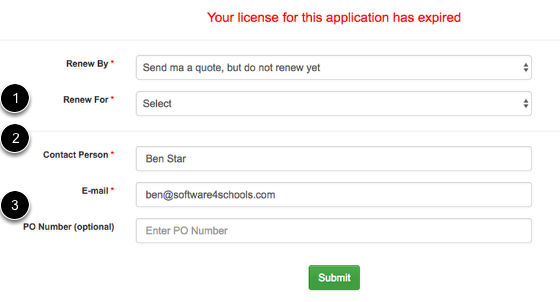 Once you processed a PO, you can send it to sales@software4schools.com and we will process your order. Renew For: Select the number of years you wish to renew your account for. Contact Person: If the contact has not changed, you can leave that as is. If there is a new contact enter their name and you will be prompted to either replace the main contact or add as a secondary contact. PO Number (Optional): If you already have a PO number and want that on the the invoice you can enter that here. If you choose one of the first renewal options, your account will instantly be renewed. The logic we use is adding 365 days to your current expiration date. So if your account is not expired, you will receive 365 days (per renewal year) from your current expiration date.